Today NYS released the 3-8 Math results for NYS. After a quick look Greece has closed the gap on the most of the county schools. Greece made the second largest gains of any School district in the county when looking at the scores overall for grades 3-8. We still have plenty of room to improve, but this is evidence that we are making progress. Looking at Monroe County as a whole, Pittsford and Penfield are out front at 91% proficient. There is then a pack of eleven schools with proficiency rates between 73% and 83%. Greece is at the bottom of this pack at 73.9% but is making progress toward the rest of the schools. Here is video illustration of how we have moved. Likening this to the world of cycling with the Tour de France going on right now, GCSD made the jump from off the packing trailing the peleton to the back of the peloton. With another solid year we can expect to be in the front of the peloton. Just like in cycling there is little difference in your results in your peloton, but it takes a steady effort with a great burst to leave the peloton and catch the leaders in the front. We will continue to do some subgroup analysis and other internal benchmarking as well as to dig into the additional comparative data that will be provided by BOCES. All of this data is publicly available the NYSED website for the 2011 and the 2012 data. Note Rochester City was left off the chart, but the Monroe County totals include Rochester City. While looking through the CCLS curiculuar documents put out by EngageNY on Friday, I came across an interesting problem and graphic. I thought for about a nanosecond where I had seen that before and then realized it is all over the new Math In Focus texts that we adopted for middle school and a key part of our Math Expressions text at the elementary level. EngageNY has posted draft curricular maps for K-5 mathematics and ELA. As tends to be the case, there is much more for ELA than math. Year-Long Curriculum Map PK-5 – Academic Year Distribution – A one page overview of time and pacing for PreK – grade 5 modules. Grade-by-Grade Progression of Mathematical Instruction – An eight page overview of the key concepts at each grade level PreK – grade 5. 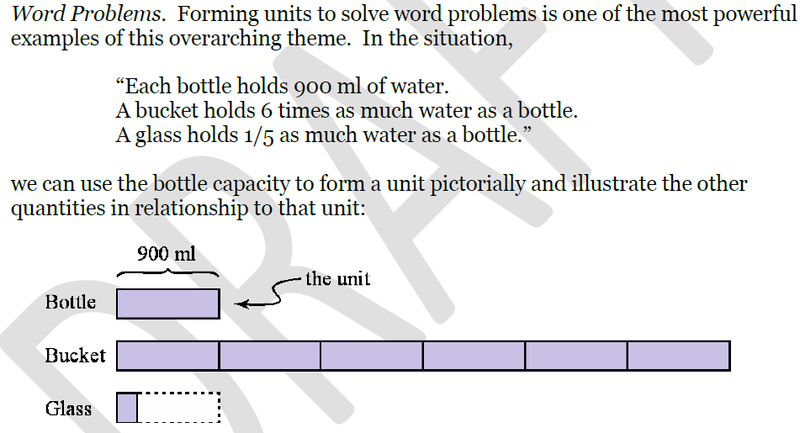 A Story of Units – Overview – A four page piece that discusses and provides examples of the inter-connected and deepening understanding of units in PreK – grade 5. Year-Long Module 1 Overviews – PK-5 – 33 pages in total this has the first Unit/Module plans for each grade level grades PreK – grade 5 each with about five pages long. Year-Long Grade Level Overview – Kindergarten – Unit or Module plans for an entire year at Kindergarten. Interpret the way the standards are conceptualized in each question. Note the multiple ways the standard is assessed throughout the sample questions. Take note of numbers (e.g., fractions instead of whole numbers) used in the samples. Pay attention to the strong distractors in each multiple-choice question. Don’t consider these questions to be the only way the standard will be assessed. Don’t assume that the sample questions represent a mini-version of future state assessments. Sample multiple-choice math questions are designed to assess CCLS math standards and incorporate both standards and math practices in real-world applications. Math multiple-choice questions assess procedural and conceptual standards. Unlike questions on past math assessments, many require the use of multiple skills and concepts. Answer choices are also different from those on past assessments. Within the sample questions, all distractors will be based on plausible missteps. Math short constructed response questions are similar to past 2-point questions, asking students to complete a task and show their work. Like multiple-choice questions, short constructed response questions will often require multiple steps, the application of multiple math skills, and real-world applications. Many of the short constructed response questions will cover conceptual and application standards. Math extended constructed response questions are similar to past 3-point questions, asking students to show their work in completing two or more tasks or one more extensive problem. Extended constructed response questions allow students to show their understanding of math procedures, conceptual understanding, and application. The June math Regents Exam scoring schedule was discussed. We will be group scoring all of our Regents exams this year. Please see the link for a final version. All PD proposal including Collegial circle proposals are due in MLP by June 1st. We are looking for one teacher from each Regent course to run a collegial circle. Please talk to Eric if you are interested in running a collegial circle or have an idea for some other PD. Please keep your eyes open for the the Twilight Academy postings and the Math Teacher Leader positions. Summer curriculum writing will be done through BOCES. It is currently scheduled to be the last week of June. Please stand by for information. While walking through Longridge today I noticed this on a whiteboard in the hall. There were no students or teachers around, just the math. It reminded me of college where one can often walk through residence halls, libraries and other study spots to see whiteboards full someones work. This high level work just left around is not even thought about in college and I wonder if it has a subliminal effect on students. 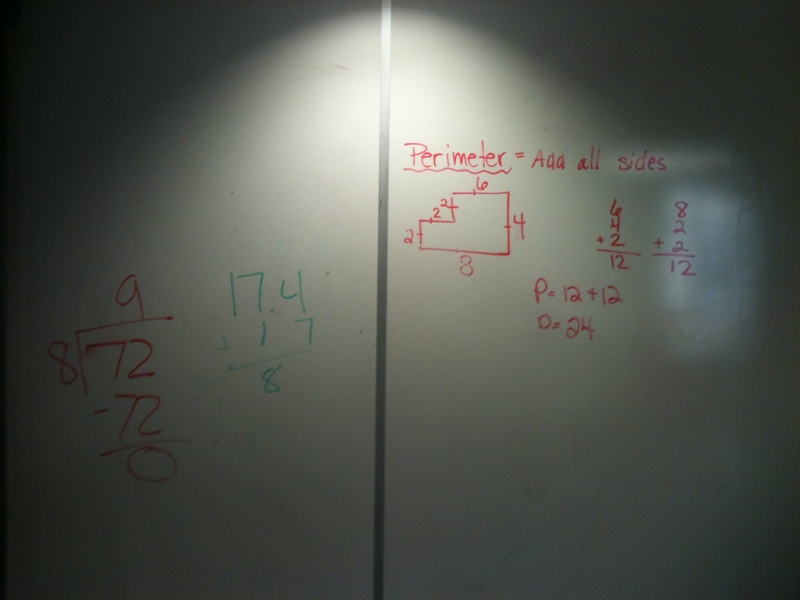 If that is the case maybe we should encourage more whiteboards like the ones I found at Longridge. I wonder what kind of effect it might have on students to see the raw work product that is math as opposed to the usual finished products that adorn the halls of elementary schools. We are not recommending that proctors advise all students before the test begins that there are two acceptable answers for this test question. This is because we expect that most 4th graders will follow the math lessons that they have been taught in school and gravitate to only one answer. We suspect that if a general announcement were made to all students before the test begins, many students would expend unnecessary time trying to arrive at both answers. I think that when teachers see the item, when they are permitted to on Thursday, they will concur with this. If it appears to a proctor that a student is expending a great deal of time on this question, the proctor may advise the student that Question 58 has two correct answers, either of which is acceptable, even if the student does not ask the proctor for clarification. Again, we apologize for any inconvenience this may cause and we thank you for your concern regarding this matter. This notice pertains to Question 13 on Form C only of the 2012 Grade 8 Mathematics Test, Book 1. Due to a typographical error, there is no correct answer to Question 13 on this test form. Proctors may tell students before the test begins that there is no correct answer for this question and students should mark any answer to this question on their answer sheets. Because it is an embedded field test question, Question 13 does not count toward students’ scores. Please photocopy this notice and give a copy of it to each teacher who will be administering this test. We apologize for any inconvenience this may cause you and we thank you for your hard work on behalf of the students in New York State. Reminder: The shrink-wrapped packages of test books may not be opened before the day of the test; Wednesday, April 25, 2012 for Book 1s. This notice pertains to Question 58 in Book 2 of the 2012 Grade 4 Mathematics Test, all forms (A, B, C, and D). Question 58 on all test forms has two correct answers. If during this test any student asks about Question 58, proctors may advise the student that there are two correct answers to this question. At the time of the scoring of the multiple-choice questions, adjustments will be made by the Department’s contractor so that all students who identify either answer will be given credit. The original memo from NYSED. We now have Minitab 16 computer software for student and teacher use at school. Minitab is one of the leading statistical software applications in use in education and business and will give our statistics students a real world tool. Minitab is a statistics software that will primarily be useful for statistics classes, but could be applicable to other classes math classes during a statistics unit. We purchased an multi-user license which allows Minitab to be installed on an unlimited number of computers in the district, but only 35 people can use the software at one time. If you would like more information on Minitab you can check out the Minitab website. If you would like to have the Minitab installed on computers in the district please complete this Minitab Request Form.